This publication and the abstract below was published by FERC on January 8, 2018. ICIT strongly encourages you to visit the FERC Publication Library to search for additional information security resources which are freely available. The Commission previously has taken steps with regard to reliability and other matters that have helped to address the resilience of the bulk power system. The Commission recognizes that we must remain vigilant with respect to resilience challenges because affordable and reliable electricity is vital to the country’s economic and national security. As explained below, we are terminating the proceeding we initiated in Docket No. 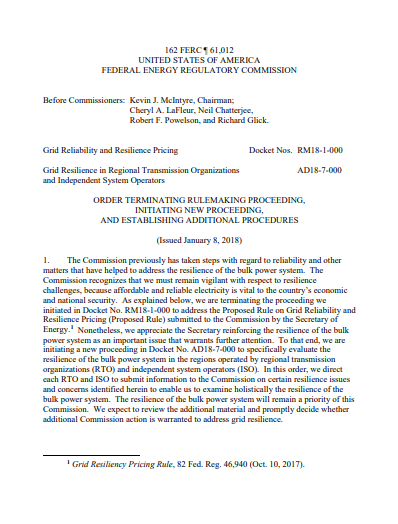 RM18-1-000 to address the Proposed Rule on Grid Reliability and Resilience Pricing (Proposed Rule) submitted to the Commission by the Secretary of Energy. Nonetheless, we appreciate the Secretary reinforcing the resilience of the bulk power system as an important issue that warrants further attention. To that end, we are initiating a new proceeding in Docket No. AD18-7-000 to specifically evaluate the resilience of the bulk power system in the regions operated by regional transmission organizations (RTO) and independent system operators (ISO). In this order, we direct each RTO and ISO to submit information to the Commission on certain resilience issues and concerns identified herein to enable us to examine holistically the resilience of the bulk power system. The resilience of the bulk power system will remain a priority of this Commission. We expect to review the additional material and promptly decide whether additional Commission action is warranted to address grid resilience.